WOUNDED HOME, Lloyd Library and Museum	» 2) Saad Ghosn, The Price of a Civil War (det. 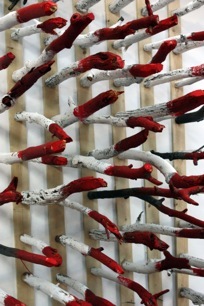 ), 2013, acrylic paint, sticks, wood, 6’ x 11’ x 18”. Photo courtesy of Saad Ghosn. This entry was posted on Thursday, August 1st, 2013	at 10:48 pm	and is filed under . You can follow any responses to this entry through the RSS 2.0	feed. You can leave a response, or trackback from your own site.